Peace, Love, & Travel Agency is making it happen for all the Mothers. We are doing our first ever Mother's Day Cruise. Grab Mom & Grandma to enjoy the beautiful island of Nassau. 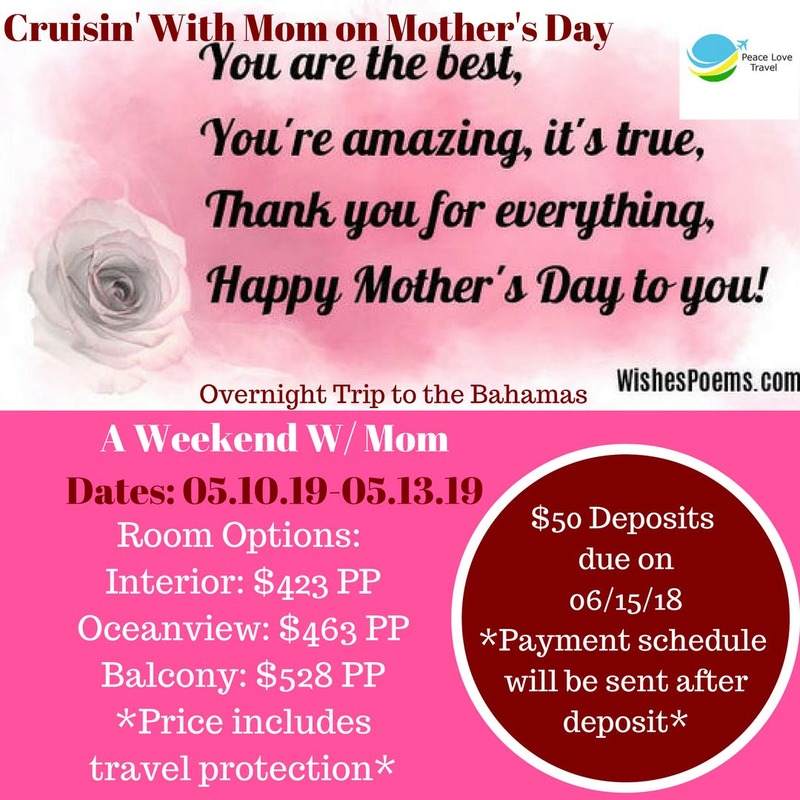 This is an overnight cruise during the Mother's Day weekend in 2019. This is an opportunity you do not want to miss. RSVP to gain access to the information for this amazing cruise. Peace, Love, & Travel Agency will help you arrange flights to the Port, if necessary. Also, we will be able to help you with parking arrangements at the Port. Make sure you use the subject: "Mother's Day 2019" in your email. Treat one of the most important women in your life to this special Mothers Day weekend trip. Enjoy 3 days exploring the Bahamas aboard the Carnival Liberty. Pack your bags and set sail to the Bahamas aboard the Carnival Liberty in 2019! Calling all Healthcare professionals who are in need of a break. You've taken care of everyone else, now take care of yourself! Treat one of the most important men in your life to this special trip aboard the Carnival Elation. Enjoy 5 nights sailing the ocean and the Eastern Caribbean.